Because it is the part of your body that is located at the very base of your lower limb, the heel gets all the pressure whenever you stand up, walk, run, dance, and jump. These activities may be seen as too mundane because you do them almost every moment of your daily life, but imagine this – those actions have been repeatedly being done since your childhood and has been causing a series of strains on that part of your body that makes contact with the ground. Your heel has been enduring your body’s weight for many years and it has been receiving enormous tensions from all your loco-motions. As you grow older, you would not be surprised if some amount of aching could be felt on your heel. When you feel pain on your heel, there can be a variety of reasons why it hurts. The causes can be arthritis, stress, wound, fracture, or (pray it is not) cyst/tumor. That is why it is important you get it checked by a podiatrist or a physician, especially if the pain is chronic, consistent, and/or recurring. Yet, there is one cause of heel pain that is common to those whose job or hobby requires a lot of footwork – it is a foot disorder labelled by medical specialists and podiatrists as Plantar Fasciitis. In a previous article, we discussed about why people get flat feet. The thing is, if you already have flat feet, more likely this condition is going to complicate itself into Plantar Fasciitis. If you have the opposite condition, i.e. (overly) arched feet, then this too can lead to Plantar Fasciitis. The plantar fascia is the tissue fibre or ligament that links the calcaneum (or heel bone) to the frontal part of the foot, the small bone connecting your toes. 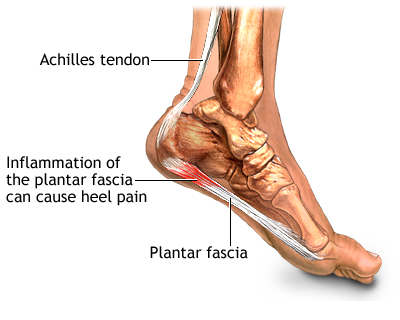 In a way, the plantar fascia serves as the break of your foot when you are walking or running. If you are standing, then it functions as the place holder of your entire weight. You can imagine what stress and irritation it experiences when it is overused and abused. When the plantar fascia is inflamed because of the irritations and stresses caused by the things mentioned previously, what you will get is a jogger’s heel or runner’s heel, medically called as Plantar Fasciitis. Some sectors even call it as the Painful Heel Syndrome. As mentioned, there are a variety of reasons why you would feel pain on your heel. That is why it is best you consult with a podiatrist and you should not wait until you cannot stand the pain anymore. Yet, there is one symptom that stands out as something particular to Plantar Fasciitis. If you experience an excruciating pain upon your first step in the morning just right after you get out of bed, and then the pain subsides as you go on with the day only to return once you stand up after a long period of sitting, then your condition is more likely to be Plantar Fasciitis. Of course, as with any other medical practitioner, the podiatrist will do a series of assessments before providing treatments or medical advice. Aside from physically examining your foot, the podiatrist may ask questions about your activities, study your medical history, and/or perform diagnostic imaging (eg. x-ray and the likes). If indeed you have been diagnosed as having Plantar Fasciitis, your podiatrist may advise you to wear a customised footwear orthotics instead of your usual shoes in order to correct the disorder. He/she may require you to do strengthening and stretching exercises on your feet while giving you medication for pain relief. The use of steroid injections is often avoided due to the scientific finding that steroids kill the muscle padding on the foot sole – this scenario can eventually worsen the condition. If the Plantar Fasciitis has gotten worse because of very late diagnosis and the aforementioned treatments may not be effectual, the podiatrist may require the performance of a surgical procedure on the foot or feet of the patient.